FILE - In this Oct. 8, 2016 file photo, Jaime Devine is carried by her husband, Thomas Devine, of Boston, Mass., during the North American Wife Carrying Championship at the Sunday River Ski Resort in Newry, Maine. 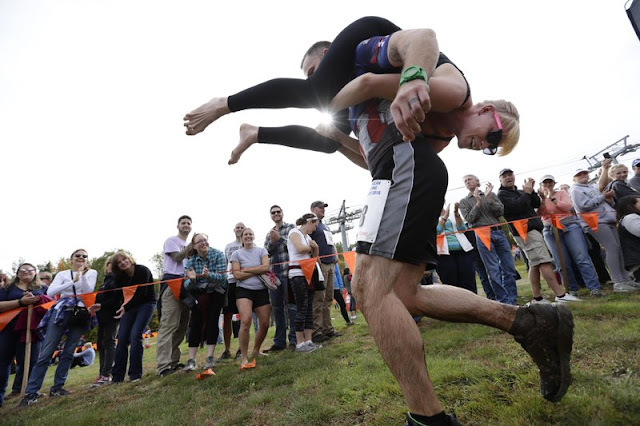 NEWRY, Maine — Dozens of participants are vying for cash — and beer — in the North American Wife Carrying Championship. More than 60 couples are registered, and more are on a waiting list, for the annual event Saturday at the Sunday River in Maine. Contestants carry their partners on their backs on a 278-yard (254-meter) alpine obstacle course. They’re competing for the partner’s weight in beer and five times her weight in cash. The legend behind the event is based on Finland’s “Ronkainen the Robber,” whose 19th century gang was known to pillage villages and take the women. These days, men usually carry a woman, but they don’t have to be married and the couple can choose who carries whom. The winners head to Finland to compete in the world championship.